In a saucepan, toast the coriander and fennel seeds over moderate heat until fragrant, about 2 minutes; transfer to a mortar and let cool. Pound until coarsely ground. Warm the 1/4 cup of oil in the same saucepan. Add the spices along with the lemon juice and let stand for 1 minute. Add the tomatoes, chopped fennel, chervil and shredded basil; season with salt and pepper. Light a grill or preheat a grill pan. Brush the scallops with oil and season with salt and pepper. Grill the scallops over high heat, turning once, until browned and just firm, about 4 minutes. 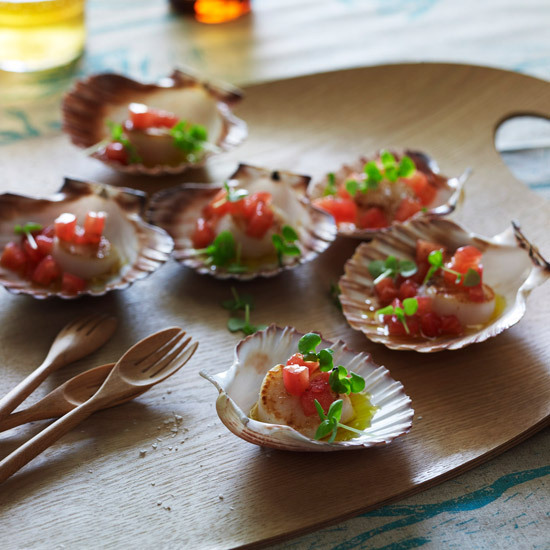 Transfer the scallops to plates and spoon the warm tomato dressing on top. Garnish with basil leaves and serve. Beer These rich, herb-scented scallops need a crisp light beer. Try Left Hand's frothy Polestar Pilsner. Or pour an unoaked Chardonnay.